Lion has a neat little feature discovered by @AppleFortyTwo. If you need a word looking up, three finger tap on your multitouch pad and hey presto, a neat dictionary pop up appears. See picture. 9To5 Mac are also reporting that the integration of Dictionary in Lion is much more prevalent including iBooks integration and an official SDK allowing developers to integrate Dictionary with ease. They also report seeing much more integration in iOS 5 for Apple mobile device suite. Apple have released details of the UK OS X Lion release and it seems to be at a very reasonable £20.99 inc VAT from the App Store as disclosed yesterday. Nice price and convenient purchase delivery! Nice One! The video of todays Apple Keynote is now available for one and all (with internet access 😉 ) from the Apple website. It has been hotly anticipated as it is each year so here is a round up and we will do our best to fill in the gaps later! LION OS X is first up. “We’re here to talk about 3 things today – Lion, iOS 5 and “some interesting cloud stuff” Steve Jobs! 250 new features in Lion OS X of which 10 covered at WWDC. Multi Touch gestures will be a big part of Lion OS X. 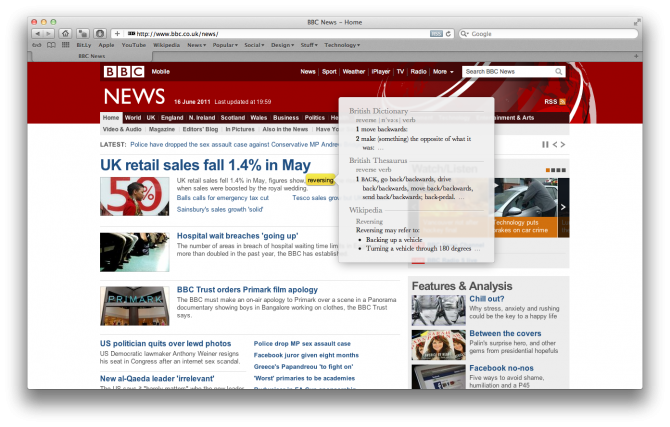 No scroll bars on Safari as it is all controlled by Multi Touch Gestures. This really puts the application in to context of what has been muted through Macbook Pros etc for a while now. It may take some getting used to but you can really start to see the tablet and desktop world coming together with all of this. Full Screen Apps, refreshing from last set of announcements from Apple. Swiping a full screen application for your desktop and swiping again to get is back, neat! Mission Control – You can have multiple desktops, full-screen apps, and dashboard widgets. Multiple desktop spaces are integrated into mission control. You can populate these spaces by dragging windows; they’re almost like little desktop folders sitting at the top of your screen. To clean up a space, click on hit and hit delete and you’re back at your original desktop space. 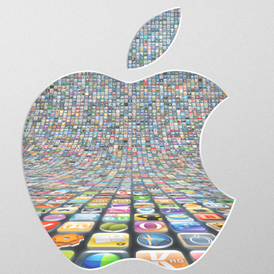 The Mac App Store is now huge. And it will be an important part of Lion OS X.
Launchpad, make a simple pinch motion and all your apps appear with apps from the App store appearing straight in to Launchpad. Autosave is part and parcel of Lion with all your Docs saved in the background as you work. Simple idea and very important/effective, but that is Apple. Versions. While editing a document, you can take a snapshot of where it is manually, they are all saved automatically, and you can browse them in a Time Machine-type interface and allowing you to cut and paste between Versions as required. Airdrop. A really simple and smart way of sharing files through Finder which will show you all the people in your network who you want to share files with. Brand new Mail. Works in full screen mode and integrates search suggestions. Looks nice with full message view to the right and messages to the Left (think Mobile Me). I can see search Suggestions being really useful. LION WILL BE AVAILABLE ONLY VIA THE APP STORE AND WILL BE A 4GB DOWNLOAD. July release $30. 10 new features in iOS. Notifications. The part of iOS that needed upgrading the most has been. Notifications Centre which you can access by swiping down from wherever you are on the screen. The lock screen gives a lot more info; you can swipe across the screen on a notification to go directly to the app it came from. Swiping a text takes you to the next text. A ticker scrolls across the top, and you can tap X to clear all your notifications. This is good, very good, at last! Newsstand. Newsstand is a place to download all your newspapers and magazines, with background downloads of susbcriptions. Twitter now built in to iOS. Now built into the iPhone, particularly apps like Camera. You can also tweet articles from Safari, Youtube, Maps, etc. Safari Reader brings an Instapaper type service to iOS. Reading list is synched across multiple devices and allows you to save stories to read later. Safari also now has tabbed browsing which is neat. Reminders. Evernote watch out! A list making feature with locations driven notifications built in. You have options to notify “when I arrive” and “when I leave”. Revamped Camera. Access from your lock screen, basic editing tools and gesture to lock the focus. Shutter button can now be your volume up button, again a nice little convenience change. Mail. Rich text formatting–bold, italics, underline etc. You can now also flag and un-flag messages, drag addresses, entire message searches which really makes iOS mail sit well alongside desktop mail clients. The iPad version of iOS 5 also has a split thumb keyboard. And finally, Over The Air software updates for your iOS devices. This really is a big step up and will open the world to people who do not like PCs or Desktop Macs (some of the elderly spring to mind like my Mum!). System will use Delta Updates – only changing parts of the Apps necessary rather than the complete App. iMessage! A new messaging service for iOS users. For all iOS5 customers on iPhone, iPad, iPod touch. You can send text, photos, videos, contacts and group messages. The system will push to all of your iOS5 devices along with delivery receipts, and it is all securely encrypted. You can pick up conversations from one device to another. It works on Network, 3G and Wi-Fi. AirPlay Mirroring. iPad to TV. Wi-Fi iTunes Syncing. Your device will find iTunes and then syncs. Also other stuff incoming with iOS5 such as new Music App for iPad and new notification tones. It all arrives in the Fall. And here it is iCloud! Everything will now be pushed to the cloud and synced across all of your devices. If something’s on your iPhone or iPad, it’s pushed to the cloud automatically, and then pushed to all devices. Totally integrated with apps. No user instigation required. MobileMe has been re-architectured to become iCloud. It will also be free. No Ads! Syncing will work with iBooks too syncing bookmarks. There will also be daily back ups of all of your important content so open up a device and everything just shows, content, bookmarks, contacts, app data, device data etc etc, really impressive. Documents in the iCloud keeps all of your documents synced and up to date across devices. iCloud will also have storage APIs so Apps can use it too. It will all work on Macs and PCs too! Photo Stream will push all of your photo library to the iCloud and sync to all of your devices, including AppleTV! On a PC the photos are pushed to your Photos folder. It works with iPhoto too if this is where you manage your photos. One point we are not sure about is that iCloud only stores 30 days worth of data and your last 1000 pictures. If you want to keep them permanently, you evidently just move them to an album. iTunes in the Cloud is also now part of the iCloud service. Now your entire purchase history is on all your devices. You can re-download any of them by pushing the iCloud button. It will be free to re-download. You can ask it to sync everything in the future. Songs are 256kbps AAC, and download to up to 10 devices. This is downloading not streaming. Not really what we expected in honesty. Basically the App Store characteristics for iTunes. You get 5GB of free storage. Photo Stream, Music and Books do not count towards this. There will be a developers 4.3 Beta released today. Ah, iTunes Match! This is how the stuff you did not buy from iTunes is handled. Scans your library and then…hey presto, stream that stuff! $25 a year! Anything not matched you can upload. iTunes matched songs are upgraded to 256kbps. The price is regardless of your library size, 5,000 or 25,000. And thats it, let us know what you think. It will be interesting to see how existing paid up MobileMe users are treated. We are now scanning the Apple website for further info! New iCloud Icon and $25 per year for the iCloud Service? 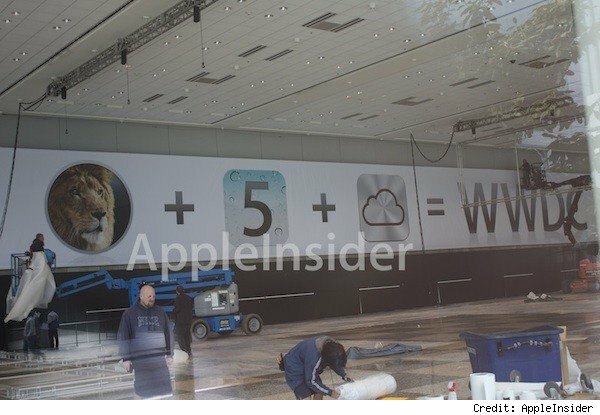 AppleInsider have posted the above image of a banner set for Mondays announcement from Apple of iCloud services along with the future of OSX and iOS to be detailed. The LA Times is also reporting that the iCloud service will likely cost $25 per annum. Not sure how that will relate to other parts of the world and how this will dove tail in with “free” elements of iCloud which are reportedly to be packaged in with OS X Lion. We will have to wait and see how much detail we get on Monday but our bet is that the service is probably going to be pretty quickly available.